The European Court of Human Rights has delivered its verdict in the case of Vasily Kononov against Latvia in favor of the latter. The representatives for Latvia had accused Kononov, the leader of a Soviet partisan squad during World War II, of killing Latvian civilians. Kononov, 87, fought against the Nazis in his native Latvia as a Soviet resistance fighter. His parents and aunt were sent to concentration camps in Germany, while his uncle and cousins were killed in combat. The European Court’s verdict was delivered by a majority vote 14 against 3, with the chairman of the jury Jean-Paul Costa and judges from Moldova and Montenegro voting in favor of the Russian veteran. The court came to the conclusion that the Latvian side had not violated Article 7 of the European Commission on Human Rights, as it had been defined in the court’s first decision taken in 2008. The Russian Foreign Ministry has condemned the Strasbourg court ruling, Interfax news agency reports. "This ruling is difficult to understand. We have just marked the 65th anniversary of the victory in World War II. It is surprising that such rulings are passed against those who were fighting against fascism," the ministry told Interfax. The verdict passed by the European Court of Human Rights was met with regret in Russia, Russia's permanent representative to the court Georgy Matyushkin said on Monday. According to the official, the Russian Ministry of Justice has been studying the resolution, which is final and not subject to appeal. It has not been a quick case. 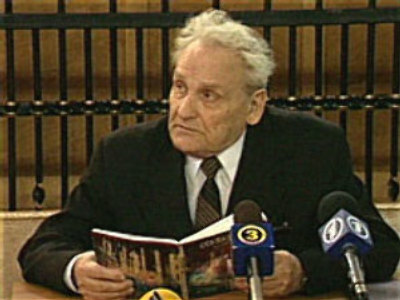 Since 1998, 87-year-old Kononov has been tried six times and imprisoned for two years. In 2008, the European Court of Human Rights ruled the Latvian judges’ decision to jail Kononov had no basis in international law and awarded him €30,000 in damages. But the Latvian government appealed, and Strasbourg has now changed its mind, saying they were right to jail him. But Kononov's lawyer says it might not be just over yet. The Kononov case exposes issues which deeply divide the country. Some ethnic Latvians view the Soviet Union as just another occupying power and see those who fought against it, even if they fought with the Nazis, as freedom fighters. But the country’s large ethnic Russian community, and Russia itself, say it is an attempt to re-write the history of World War II and belittle the Soviets’ role in liberating Latvia. The Russian Foreign Ministry has condemned the ruling in Strasbourg. “Essentially, the fact that the European Court for Human Rights has agreed with Latvia's position means that the Court's legal approaches in evaluating the events and results of World War II are legally unjustified and politically flawed,” stated Foreign Ministry Spokeman Andrey Nesterenko. And historians too, think it is a dangerous example of political interference in the past. Vasily Kononov himself said that Latvia lied to the court. “Latvia has successfully fooled European court. Long ago it got rid of the main evidence from my case that the people who were executed were volunteers, armed combatants. Latvia claims they were farmers. That is a lie. Under German occupation they were not farming. They were spending whole nights on patrol and were sleeping over the day,” Kononov told RT. “We have a right to appeal this decision. We are preparing it as fast as possible and our position is gaining a lot of support from many European countries and I am sure the decision will be made soon and in our favor,” he added. “Latvia has deceived the court. They took a number of documents out of the case – both papers from the country’s state archives and witnesses’ testimonies,” Kononov said in an interview with Russian news agency RIA Novosti. “Those civilians were armed; they were Schutzmanns (Nazi security force manned with conscripts from the population of occupied territories – RT). German special services had set up a base in their village. Those people actively participated in killing partisans. They lured 12 people into a trap, shot them dead and burned them. The partisans’ tribunal considered their case, ruled them guilty and sentenced them to capital punishment,” the veteran said in the interview. Kononov also said that the European Court’s decision was an attempt to revise the ruling in the Nuremberg Process and a move aimed at broadening the rift between Latvia and Russia. Vasily himself was wounded many times, suffered shell shock twice and needed three operations for his injuries after the war. Kononov says the Nazis were tipped off by collaborating locals and police. “They persuaded the partisans to stay for the night but the police chief sent his deputy to the Germans when the partisans went to sleep. German soldiers encircled the barn, there was a fight and then the Nazis set it on fire,” said Kononov. After a tribunal, his partisans tried and executed nine villagers who, according to him, were armed collaborators. But Latvian prosecutors say they were unarmed civilians and claim Kononov is a war criminal. In 1998 the man was arrested on charges of killing innocent people. Since then, Kononov has been tried six times and put in prison for two years. In 2008, the European Court of Human Rights ruled that the Latvian judges’ decision to jail Kononov had no basis in international law and awarded him 30,000 euros in damages. But the Latvian government appealed, and Strasbourg has been looking at the 12-year-old legal saga once again. Adrian Pabst, a political science professor at the University of Kent, believes it is possible to aim for consensus on what fascism was, and who fought it. “I think it’s right to press that issue, because… it is also a question of resisting fascism today as it’s rearing its ugly head again across Europe, both West and East, including in Russia,” Pabst told RT. “So, I think it’s right of President Medvedev to keep on reminding the world that there was unity on the fight against fascism,” he added.